This product can expose you to chemicals including Bisphenol A (BPA), which is known to the State of California to cause birth defects or other reproductive harm. For more information go to P65Warnings.ca.gov. Very lightweight but durable. Nice fit. Love the wrap around view. I would recommend these to anyone. Purchased 4/30, today is 5/9 and it has not been shipped. The are "not" anti fog. These glasses were much better than expected...just the right amount of shade for use in darker areas like the woods or low light areas....safety wrap around is nice. 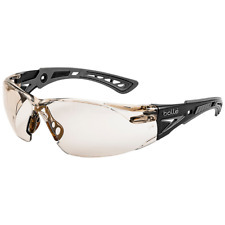 NEMESIS SAFETY GLASSES - SMOKE MIRROR-ONE OF THE MOST POPULAR! !